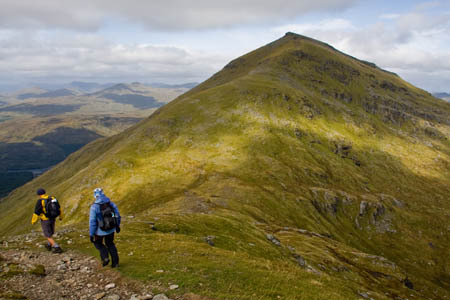 This walk is a chance to bag two munros in one outing. 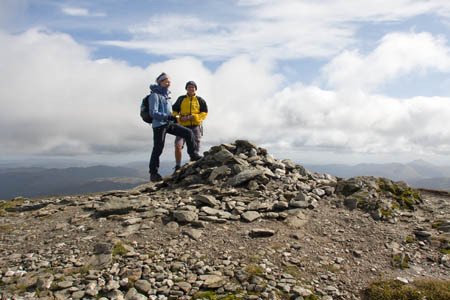 The giant twin peaks of Crianlarich, Ben More and Stob Binnein, are a great destination which, on a clear day, will give a fabulous vista of the Highland mountains. Crianlarich is served by trains on the West Highland line from Glasgow in the South and from Fort William and Oban in the North. Mapping and route data for this walk are available on our grough route system. This includes the route, profile, timings and other information, which can be customised to your own fitness levels. Note: grough routes should be used in conjunction with maps, a compass and other navigational aids. 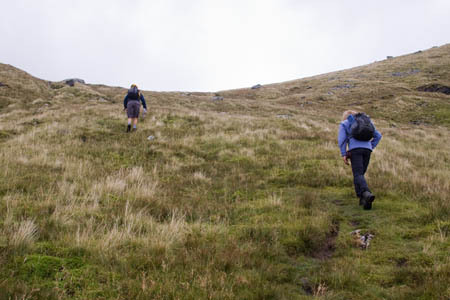 Routes often use access land and involve finding your route off footpaths. Knowledge of and competence in using a map and compass are essential when using the routes. Carry the correct equipment for the conditions and be aware of hazards in the outdoor and upland environment. This route requires a good level of fitness. Only undertake it if it is within your capabilities. The straggling village of Crianlarich nestles below the towering twin peaks that dominate the view from Strath Fillan. 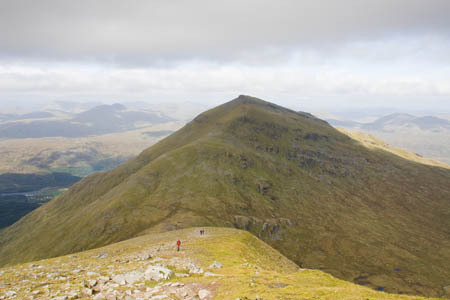 Ben More and Stob Binnein are two giants of the munro pantheon and, fortunately for baggers, are close enough to walk in a bargain two-for-the-price-of-one expedition. 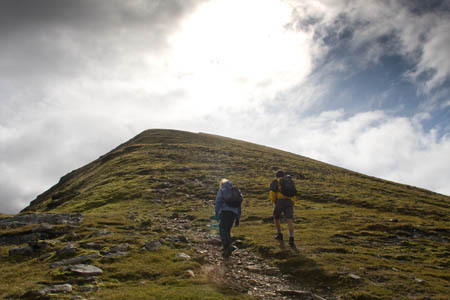 But be warned: although there’s little technical difficulty in summiting the 16th and 18th highest of the Scottish munros, strength and stamina are needed for this strenuous but rewarding walk to the pinnacles of these two southern Highlands mountains. Crianlarich itself owes its importance to history. A’ Chrìon Làraich – the low pass – was just that until Field Marshal George Wade ordered the construction of his system of military roads to get troops into the Highlands to quell the garrulous clans. Two of the military roads met at Crianlarich, and with the building of the railways a century later, the village became an important junction for trains heading north too. 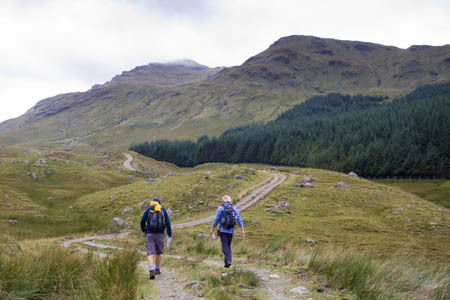 There’s nothing extraordinary about Crianlarich, but it is a walkers’ base and the residents understand the importance of extending a welcome to hillbaggers and display a detailed knowledge of many of the munros and other mountains surrounding the settlement. There is plenty of accommodation, a pub – the Rod and Reel – that will test drinkers’ sobriety before even the first malt has gone down, with its curiously sloping floor, a youth hostel and a shop. And, of course, mountains aplenty. There is a route from Balquhidder in the South, but this involves a long drive round. The shortest route from Crianlarich is also unfortunately the most severe: a 1,000m upwards slog straight out of the box from the roadside in Glen Dochart. But there is a way of softening the blow. Our route follows the track up Benmore Glen to the col between our two munros, giving the legs and lungs a little acclimatisation time. Ben More, or in Gaelic Beinn Mhòr, means simply big mountain, and it’s an apt name. 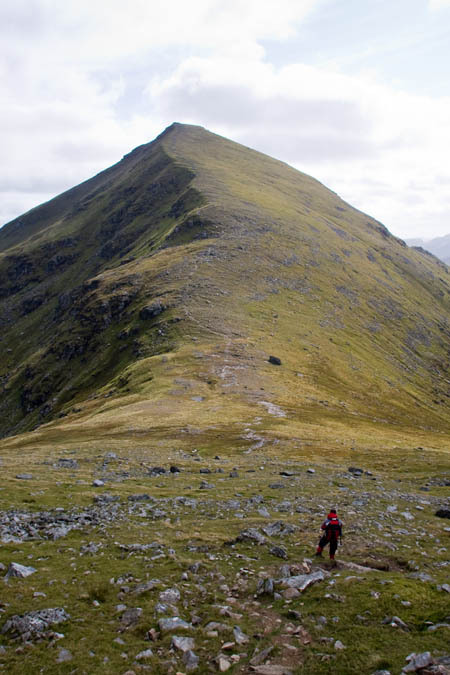 Its neighbour Stob Binnein translates as conical peak, which again is descriptive though the mountain’s top is flattened for a couple of hundred metres, giving its distinctive and unmistakable profile. The route starts 50m or so past Benmore Farm, where the barn doors are adorned with ‘no parking’ graffiti. There is room at the roadside to pull a couple of vehicles on to the hard verge, but if you’re concerned about leaving your car here, there is a layby a kilometre or so along, overlooking Loch Iubhair. 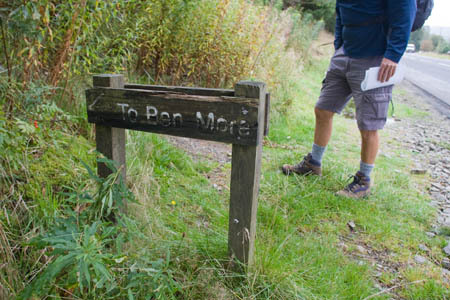 The start of the path is marked by a wooden sign saying, helpfully ‘To Ben More’. A stile leads to the track, which zigzags up to a gate at the start of Benmore Glen. The bulk of Ben More fills the vision as the track is ascended and, should you wish, you can leave the track shortly after passing through the gate, where the direct path cuts back on itself briefly before heading straight up on an initially indistinct route that soon becomes easier to follow. But it’s a lung buster to make the direct ascent to Ben More, so our recommendation is to continue along the track into Benmore Glen. Cruach Ardrain looms in the distance to the right, but that’s a munro for another day. Follow the track for 1.6km to the point above the rickety footbridge to the right. Slowly, the peak of Stob Binnein comes into sight and the bealach between today’s munros. After passing the bridge, the path is less distinct and passes over some boggy ground for 800m before turning left and making a beeline uphill beside the unnamed burn coming straight down from the col.
Keep the burn to your left and use the increasingly extensive views to the North and West as an excuse for your frequent halts up the 400m (1,312ft) of hillside leading to the Bealach eadar-dha Beinn – the col between two mountains. If it feels like hard work, that’s because much of it is approaching the thigh-burning 30 degree angle. But the stops are worth it, with grand views of Cruach Ardrain and Stob Garbh and, farther afield, Ben Lui, Ben Cruachan and the hills of the Black Mount. The arrival at the bealach opens up the eastward vista to Stob Creagach and beyond. Turning right up the final path to the summit of Stob Binnein reveals the mountain not to be a uniform pyramid shape, but more of a wedge, its eastern slopes steeper than those to the west. 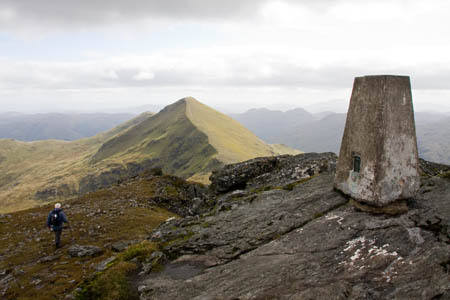 The peak of the 1,165m (3,822ft) munro is a slender rocky plateau, marked by an untidy cairn. 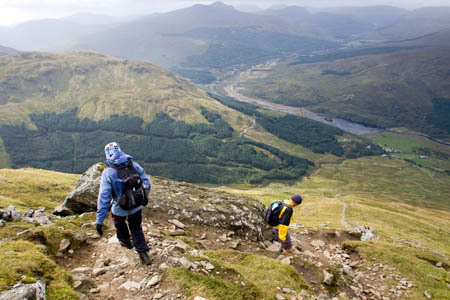 On a clear day, the views are extensive, down to Ben Lomond and beyond, to Glasgow. 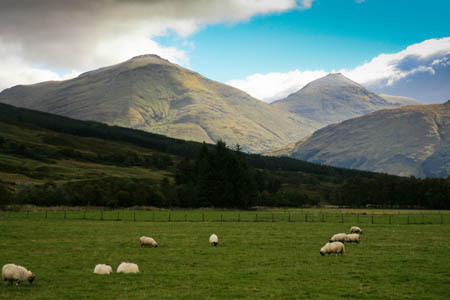 To the North-East, Ben Lawers towers above Loch Tay, and peaks galore stretch to the North and West, with Stob Ghabhar clearly in view beyond Bridge of Orchy. Turn on your heels and retrace the route down to the Bealach eadar-dha Beinn, enjoying the forward vista dominated by the bulk of Ben More, its even pyramid broken only by the outcrops of Creag Tharsuinn. With the col reached, it’s time to gird the loins again for the climb to the second peak of the day. There’s another 285m (935ft) of slogging to be done to gain the highest point of the walk. 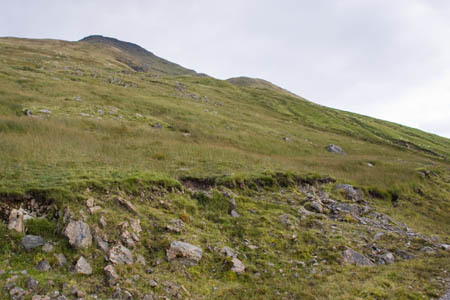 The footpath is straightforward until a slight scramble is reached on the rocky section leading to Ben More’s summit. However, this shouldn’t present much difficulty at all and can easily be bypassed by heading to the right of the outcrops. The summit itself consists of a broad sloping plain topped by a rocky outcrop which is itself surmounted by an Ordnance Survey trig pillar. Clamber on to the rocks and bask in the warm glow of knowing no land in Britain south of you is higher. On a clear day, the vista from the 1,174m-high (3,852ft) summit is superb, with Loch Tay laid out north-eastwards, and mountains as far as the eye can see. Strath Fillan curves north-west to Tyndrum, overlooked by Ben Lui’s twin summits, and behind it the ridges of Ben Cruachan. A large cairn sits at the northern end of the narrow plateau, and the safest route off the summit is to drop to the right of this and follow a feint path round north-westwards, to avoid encountering the rocky upper reaches of the shallow corrie of Sloc Curraidh. Rounding the shoulder of Ben More, with the valley floor of Strath Fillan deep below, it feels like stepping off the edge of the world, and it soon becomes clear, as the path is found, just what a steep slog this would have been straight from Benmore Farm. The path, at times rocky, otherwise a little eroded, descends at more than 30 degrees in part, and will certainly test the knees. A tumbledown drystane dyke (wall) is reached. Quite why this edifice, a rarity in the Highlands, was built, going from halfway to nowhere to part way up the corrie is anybody’s guess. The track, long time in view, seems a long time coming as nearly 990m of descent takes its toll on muscle and joint. The path eventually all but peters out as it approaches the track, and becomes wet underfoot. But the Benmore Glen track does finally give some firm footing and it is then simply a matter of retracing the first kilometre or so of the walk. In winter conditions, this route will require full kit including crampons and ice axe and the ability to use them. Care should be taken in avalanche-prone areas, particularly the corrie of Sloc Curraidh.